Drain Field Services in Bartow– Those in rural living areas aren’t close enough to a sewage plant to utilize these services, so they often use septic tanks to process and dispose of waste. A septic tank is a cement or metal box that holds, on average, about 1,000 gallons of liquid, buried deep in the ground, and is connected to several pipes. Waste flows from sinks and toilets into the tank and forms layers. Heavy waste items travel to the bottom of the septic tank, while the water in the tank contains chemicals and bacteria that treat the sewage. When the water flows out of the tank, it goes into the drain field, which is a group of perforated pipes filled with gravel. 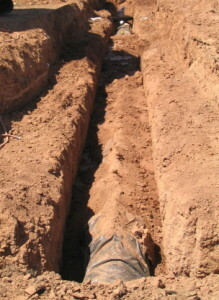 This drain field will absorb and filter the water, which is a very important step in the septic tank process. Therefore, using professional drain field services is recommended, since experts can make sure you have the proper number of pipes for the type of soil in your area. If you need professional drain field services, call William Dustin Septic. Our experts offer 24-hour emergency septic service, 7 days a week, so we can come to your Bartow, Florida property at any time an emergency strikes. We also offer routine scheduled drain field maintenance, where we will look for and treat any problems before they cause severe issues. In addition to drain field services, we offer lift station pumping, sump pump installation and maintenance, and other useful septic services. Let us save you the trouble of cleaning and maintaining your own septic tank. We offer drain field services throughout Central Florida, including Bartow, Mulberry, Auburndale, Polk City, Plant City, Winter Haven, Lake Wales, Lakeland, Lake Alfred, and Haines City, FL.